When we speak to clients on the importance of projector cleaning, we like to use the example of an oil change for your vehicle: “Would you go an entire year without taking your vehicle in for an oil change?” The answer is always an emphatic “No!” A regularly scheduled oil change extends the life of your engine and improves your vehicle’s performance. The same is true as it applies to projectors. Projectors contain cooling and optical systems that become clogged with fine dirt and dust particles. If allowed to accumulate over time, this can cause the premature blocking of filters, lamps to explode, overheating and even serious damage to major components such as the optical engine and main board. This dirt and dust must be removed to allow for the efficient cooling and transmission of light in the projector. Fact: A standard projector draws approximately 50 cubic meters of air through its fans on a typical day. It is simply not enough to clean the filters. These external filters help to trap particles down to 100 microns. Anything smaller will pass through to the optical engine and the remainder of the internal components. The environment where projectors are used is a major determinant with regards to the frequency of cleaning that is required. For example, high traffic areas, poorly vented buildings, carpeted rooms, etc. Fact: More than 80% of projectors and 90% of projector lamps that fail could have had an extended life span through regular cleaning. Therefore, periodic cleaning is required in order to extend your projector’s life and maintain optimum performance. Why is Qualified Cleaning Crucial? Manufacturers have done much to minimize this contamination problem. However, since all projectors are not sealed or isolated from dust, the need to maintain quality image projection at all times and to ensure trouble-free operation of a projector demands the provision of scheduled cleaning throughout its life. A projector is an intricate composition of electronics, optics and light. The optical components within a projector are extremely sensitive and can be irreparably damaged if mishandled. Just as you would only take your vehicle to a qualified service centre, your projector requires the same consideration. All DLP projectors be cleaned twice annually. All LCD projectors be cleaned once to twice annually depending on how dusty the environment is. Implementing our recommendation to the service schedule of any projector will result in benefits of improved image quality, reduced downtime, longer projector and lamp life, and ultimately, cost savings. 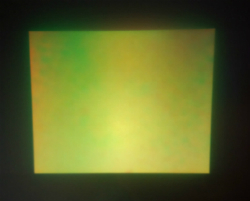 Before and after pictures of cleaning done on a contaminated projector. 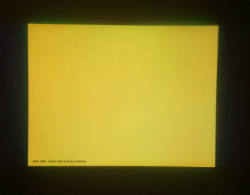 Secondary colour of yellow used for testing. How important is a web page?